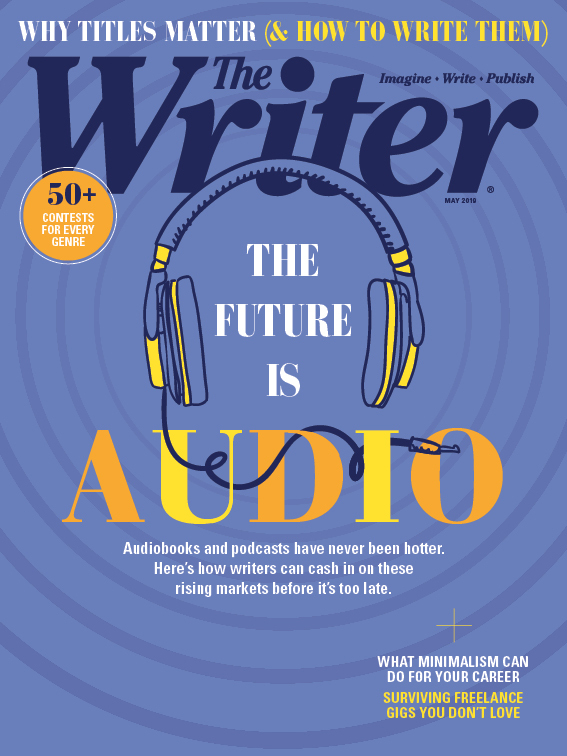 Join thousands of successful writers when you subscribe to The Writer magazine. Each month The Writer is full of features you can use to improve your writing, including before-and-after examples of improved writing, more literary markets than ever before, practical solutions for writing problems, selected literary magazine profiles, tips from famous authors, and hands-on advice. Here’s what’s in our current issue. How to sustain your writing career with minimalism. Learn the skills and tools that shape imperfect human conversation into a podcast episode. Audiobooks are on the rise. Here’s how to cash in on this rising market. Read the first-place winner of our “After the Fall” short story contest. Have fun and expand your range with a second (or third) genre. An interview with best-selling, genre-hopping author Delilah S. Dawson. Titles introduce your work to readers. Here’s how to give them the meaty role they deserve. It’s easy and inexpensive, plus it will make you feel good. What’s not to love? Why merely publish short fiction when you can also give writers a glimpse at how it was made?